This tutorial provides you with a foundation for working with Adobe Dreamweaver images. It is the first lesson in the Adobe Dreamweaver CS6 Digital Classroom book. For more Adobe Dreamweaver training options, visit AGI’s Dreamweaver Classes. While it is possible to resize images with Dreamweaver, it’s generally not a good idea. 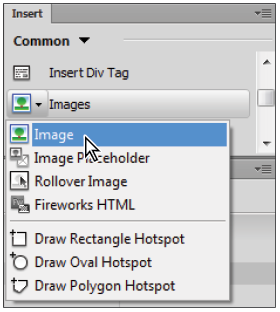 Specifying the width and height of an image in the Property Inspector changes the display size of the image, but it does not resample the image the way a graphic processing application like Photoshop does. For example, a JPEG image that is 150 pixels by 150 pixels might have a file size of 30k. You could resize this image in Dreamweaver by 50% and the result would be a thumbnail image displayed at 75 pixels by 75 pixels. However, even though the image is visually smaller, the file size remains the same. A visitor to your website still must download the 30k file and this translates to slower loading time for the image (and possibly the page) and a potentially poor user experience, especially if they have low bandwidth. 1 Double-click on products.html in the Files panel or click on the tab, as it’s still open. Place your cursor after the word Produce and press Enter (Windows) or Return (Mac OS) to create a new line. 2 Choose Insert > Image. The Select Image Source dialog box appears. If your site folder does not open automatically, click the Site Root button, and then double-click the images folder. Select beets.jpg and press OK (Windows) or Open (Mac OS). 3 When the Image Tag Accessibility Attributes dialog box appears, type Beets in the Alternate text field. Press OK. The Alternate text field in the Image Tag Accessibility Attributes dialog box corresponds to the Alt attribute of an <img> tag. Including a description of the inserted image in this field is not technically necessary, but it is good practice. It provides information about the images to visually impaired visitors using screen readers. Also, Alt text is displayed in place of images on some handheld devices, and browsers where images are disabled. 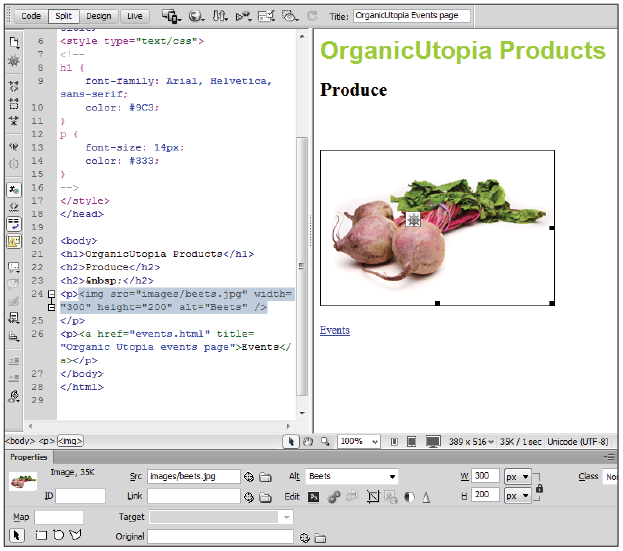 4 Click on the Split button in the Document toolbar to view the code that was written by Dreamweaver when you inserted beets.jpg. An <img> tag was created, with four attributes. The src attribute is a relative link to the .jpg file in your images folder. The alt attribute is the alternate text you specified in the last step. The width and height attributes are simply the width and height of the image, and these have automatically been added by Dreamweaver. Press the Design button to return to this view. 5 Double-click on the images folder in the Files panel to reveal its contents. In the document window, click to the right of the beets image and press Enter (Windows) or Return (Mac OS) to create a new line. Click and drag cucumbers.jpg from your Files panel directly below the beets image in the Design view. When the Image Tag Accessibility Attributes dialog box appears, type Cucumbers into the Alternate text field. Press OK.
6 Click to the right of the cucumber image to place your cursor, and press Enter (Windows) or Return (Mac OS) to create a new line. To add the last image, you’ll use the Insert panel on the right side of your page. Click the menu at the top of the Insert panel and choose Common from the list. Click on the Images:Image option, and the Select Image Source dialog box appears. 7 Navigate to the images folder if necessary, select the eggplants.jpg image, and press OK (Windows) or Open (Mac OS). 8 Type Eggplants in the Alternate text field of the Image Tag Accessibility Attributes dialog box, then press OK.
9 Choose File > Save and leave products.html open for the next part of this lesson. 1 In products.html, click on the image of the beets to select it. In the Property Inspector, type images/beets_large.jpg into the Link text field. Press Enter (Windows) or Return (Mac OS). The 5-pixel border around the image turns blue. This border indicates that the image is a link. 2 Click on the image of the cucumbers to select it. In the Property Inspector, locate the Point to File icon ( ) next to the Link text field. Click and drag this icon into the Files panel. An arrow with a target at the end follows your cursor. As you hover over items in the Files panel, they become highlighted. Release the mouse while hovering over the cucumbers_large.jpg file. With the Point to File feature, you can simply click and drag to create a link. 4 Choose File > Save, and then File > Preview in Browser. Click on the thumbnails to see the large versions of each image. You’ll have to use your browser’s back button to get back to the products page. Often, you will want to start building web pages before you have all the final content available. This happens regularly in professional situations where different people may be responsible for preparing images, writing copy, and creating the site. Next, you’ll build a second section in the products.html page that will eventually include a collection of chocolate pictures. 1 In Dreamweaver, on the products.html page, place your cursor to the right of the eggplants.jpg image, and press Enter (Windows) or Return (Mac OS) to create a new line. 2 Type Chocolate, then press the HTML button in the Property Inspector and choose Heading 2 from the Format drop-down menu. Place your cursor at the end of the word Chocolate and press Enter/Return to create a line below this new heading. 3 Choose Insert > Image Objects > Image Placeholder. 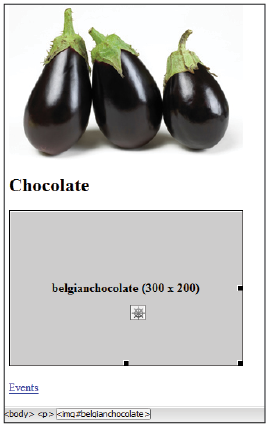 When the Image Placeholder dialog box appears, type belgianchocolate in the Name text field, 300 in the Width text field, and 200 in the Height text field. Leave the Color set to the default and the Alternative text field blank. Press OK to exit the dialog box. A gray box with the name belgianchocolate appears. This box is simply an <img> tag with an empty Src attribute. If you are new to web design, it’s important to note that placeholders are not required, but they are useful in allowing you to visualize a page when you don’t have images available. Now you’ll insert an image into the placeholder by setting the Src attribute in the Property Inspector. 4 With the belgianchocolate image placeholder selected, click and drag the Point to File icon to the right of the Src text field and locate the belgianchocolate.jpg image. The image of the Belgian chocolate replaces the gray box. 5 In the Property Inspector, use the Point to File icon of the Link text field to link belgianchocolate.jpg to belgianchocolate_large.jpg. Choose File > Save and leave this file open for the next part of this lesson.